It's known and an accepted fact that smoking is bad for your health. Tobacco contains nicotine, a highly addictive drug that makes it difficult for smokers to get rid of the habit. Tobacco products also contain many poisonous and harmful substances that cause disease and premature death. • While nicotine exits the body within a relatively short time frame (8 to 12 hours), the effects of nicotine in the brain can last for months. Tobacco-delivered nicotine alters the structure and function of the brain. • Believe it or not, smoking could turn a man bald! Researchers have found that puffing on fags makes men prematurely bald as it accelerates the process of hair loss. • Smoking mild cigarettes are safe. There is no safe cigarette and no safe level of consumption. Some people try to make their smoking habit safer by smoking fewer cigarettes, but most find this hard to do. • Smoking socially or occasionally is fine and anyone can quit at anytime. Anyone who smokes is at a risk of becoming addicted to nicotine. It is never too early for cigarettes to cause damage; it can start with the first cigarette. • 20 minutes after quitting, blood pressure drops to a level close to that before the last cigarette. • 8 hours after quitting the level of carbon monoxide in the blood returns to normal. • 24 hours after quitting the risk of a heart attack decreases. • 2 weeks to 3 months after quitting circulation improves and lung function increases up to 30%. • 1 to 9 months after quitting symptoms such as coughing, sinus congestion, fatigue, and shortness of breath decrease. • 1 year after quitting the extra risk of coronary heart disease is reduced to half that of a smoker. 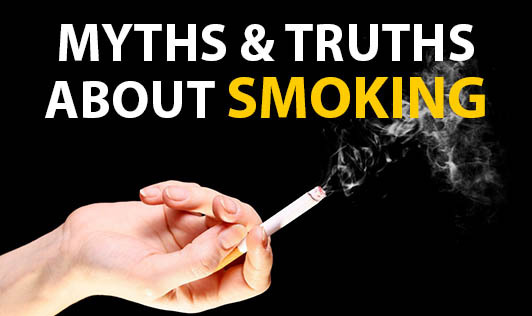 • 5 to 15 years after quitting smoking stroke and risk of coronary heart disease is the same as a non-smoker.